As a data-driven advocacy organization, the Colorado Children’s Campaign recognizes that accurate and reliable information is essential to the development of sound public policy. Producing, gathering and analyzing reliable, data about children and children’s programs, dis-aggregated by race and ethnicity where available, is our expertise. Sharing these data in easy-to-use formats with those who care about kids is a critical part of our mission. 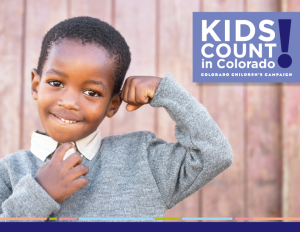 The Children’s Campaign’s signature report, KIDS COUNT in Colorado! , is released on an annual basis and provides user-friendly state- and county-level data on how children are faring. In addition to KIDS COUNT, the Children’s Campaign also produces a variety of reports and white papers on topics related to child health, K-12 education, early childhood learning and development, and fiscal issues impacting kids. The data in these reports serves as a basis for our policy agenda, including legislative priorities. They reveal the greatest obstacles Colorado’s kids face, shine a light on racial and ethnic disparities in child well-being, and point us to opportunities to improve children’s lives through policy solutions. We also share our data and research with fellow child advocates, community and business leaders, legislators, and direct service providers who use them to inform their own efforts on behalf of kids. KIDS COUNT is a national and state-by-state project of the Annie E. Casey Foundation to track the status of children in the United States. The Colorado Children’s Campaign produces KIDS COUNT in Colorado! as part of that project. Ours is an annual data initiative to assess and share information about the well-being of Colorado’s children and trends that are impacting their lives. 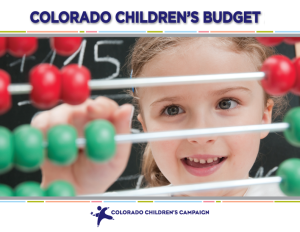 The Colorado Children’s Budget is intended to be a resource guide for policymakers and advocates who are interested in better understanding how Colorado funds children’s programs and services. Our goal is to provide data and basic analysis to help you, the reader, better understand state investments in programs and services benefiting children. The Children’s Campaign also publishes periodic reports and other publications on timely topics within our priority issue areas. For more information or questions about our research and data, or to request a presentation by Children’s Campaign staff, please contact Sarah Hughes, Research Director, at Sarah@coloradokids.org or 303.620.4527. Most of our publications are available to download free of charge on our website. Hard copies of KIDS COUNT in Colorado! are available to order. If you are interested in a hard copy of a report not found online, please contact us at 303.839.1580.